If you are like me, you are suffering from post-World Cup depression. Like so many viewers around the world, for the last month I have been glued to my television, enthralled by the excitement, skill and tension playing out in Brazil. Now I’m suffering from withdrawal. If someone had written a script for this World Cup, I doubt it could have encompassed as much drama over the past weeks in Brazil. Heroes were made — like the 23-year-old Colombian James Rodríquez, who scored a tournament-high six goals. And so were villains — the bite seen around the world by Uruguay’s Luis Suárez overshadowed much of his brilliant play on the field. Powerhouses (Spain) were easily overthrown, while underdogs (Costa Rica) threatened the traditional hierarchy. The flamboyant and emotional host nation was stunned and silenced by the perfectly executed game plan of Germany. Cultures and playing styles clashed, individuals surprised and disappointed, fans screamed in celebration and wept with disappointment, all for a game that transcends the playing field. Why Is the Beautiful Game So Beautiful? I still contend that soccer is well worth all the hype. The beauty is in the details. The nuances are what make the long games with frequent low scores so fascinating and enthralling. The game is a constant battle of vastly different athletic abilities and skills. Technique, ingenuity, speed, strength, quickness, agility and stamina are on a constant sliding scale as teams compile their best mixture to match opponents. I constantly observe how team tactics can combat individual brilliance, which can come in so many forms, and vice versa. The sheer number of avenues to success breeds a sporting competition like no other. A low-scoring game allows for more chance of an upset. This World Cup highlighted the importance of last-minute goals and that no underdog can be underestimated. This adds an element of tension unique to the sport. How Could I Be So Disappointed by the Golden Ball Winner? I am a huge Leo Messi fan. I think he is possibly the greatest player ever to play the game and I wanted Argentina to win the World Cup solely so that he could add it to his résumé. I am not one of those who think that everyone on the field must put equal effort and work hard defensively. I don’t mind Messi saving energy for the important moments of brilliance he is able to produce. I watched in disbelief, however, as the minutes of the final ticked away and his effort did not change. And then Argentina was down a goal. Still no change. There was no longer anything to rest for, yet Messi walked and waited for his moment. That moment never came. As the final whistle blew, I was happy that Germany had won. The greatest player in the world, who I had once seen chase down opposing defenders and win the ball back for his team or lay off the ball on the halfway line and work to get into the box to get on the end of a cross, did nothing of the sort. I don’t care how tired he was, how frustrated. … I cannot fathom walking through the last five minutes of the World Cup final. I think Messi is brilliant and capable of things that no other player on the planet can do. 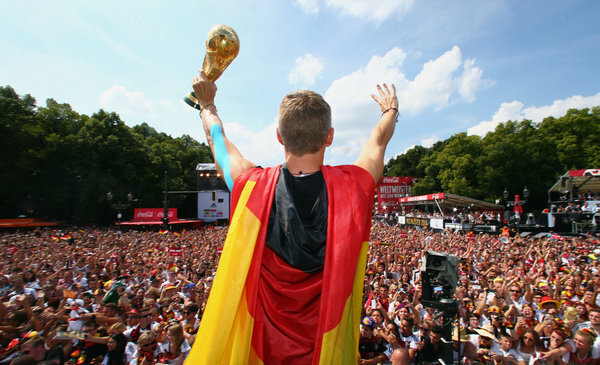 But in my estimation he was not the best player at the World Cup, nor did he deserve to hoist the trophy. Will the Hype Last in the U. S.? As I looked on Twitter to see the lineups for Germany-Argentina, I said: Can you imagine what it would feel like to be warming up, about to start in a World Cup final? One of the people I was with laughed and said, referring to the video game, “Yeah, I do it like every day on FIFA.” The sad truth is that, to a lot of Americans, soccer is still only a fun game to play on Xbox, a weird foreign fascination to get hyped about once every four years. In the wake of the biggest sporting event in the world, which permeates cultures everywhere, perhaps the United States has bounced back most quickly. “SportsCenter” has an abundance of news from other sports to cover, with relatively minimal residual World Cup analysis. That being said, I have a lot of hope. Despite the Jimmy Kimmel segment, in which a handful of self-proclaimed serious soccer supporters erroneously commented in-depth on Landon Donovan’s performance in the World Cup, I do think our country is starting to fall in love with the game. Walking through Dupont Circle in Washington during the U.S.-Germany game gave me a sense of the passion felt around the world. The soccer jerseys I saw on the metro, worn everywhere and pervasive comments on social media also signified the unprecedented support for the American team. It was important that we emerged from group play, because after all, our society is obsessed with winners. My hope is that the drama, tension, and excitement has made more people fall in love with the game I have loved for years. Maybe true love takes a while, but this World Cup was surely a good first date. I smile and sign autographs no matter what. Most fans don’t seem to care much if we won or lost. They don’t know if I had the game of my life or a complete shocker. They say, “Great game! You were awesome!” Sometimes they even tell me I was wonderful when I didn’t play a single minute. I thank them whether I feel on top of the world or have a lump of disappointment in my throat. What the fans don’t know is that sometimes after a bad day at the proverbial office, I need them more than they need me. The 11-year-old with the Washington Spirit jersey doesn’t know how I feel as I smile and take a selfie with her. To that girl, I was already successful the second I stepped onto the field to warm up. She isn’t judging my every move or measuring me based on my personal goals. If there’s one lesson playing professional soccer has taught me, it is to redefine my notion of success. Success is relative, subjective, and often very abstract. With the exception of the Seattle Reign, most National Women’s Soccer League teams have embarked on a roller-coaster ride results-wise this season. As players, the majority of us come from winning programs. Whether with our youth clubs or college teams, we spent the first 20-plus years of our careers training a mentality of dominance, personally and with our teams. So for most of us, it’s mind-boggling to be fighting to stay above .500 or to be flirting with mediocrity in our performances. Consequently, I have learned to define success not in the outcome but in the process. It has become about consistently moving forward — not necessarily checking a goal off my to-do list. I try to turn my attention to more process-oriented thinking. Before I play, I make a personal script and fight to stick to that script. I identify what I need to do — where I should be receiving the ball, the angle I need to take to be able to go forward with my first touch, the technique I need to use to win balls in the air — and only give my attention to those objectives. I know exactly what I need to do to have a good game and I battle to make that happen. It’s the same with my team. We go into every game with the aim of winning. But soccer is known to defy logic — sometimes you can do everything to prepare and the result still doesn’t go your way. The Washington Spirit has gotten points in our last three games, which is a club record, and obviously a streak we strive to continue. It’s a constant fight for consistency, however. As we scrap to grind out results, put together complete performances, and find the perfect system and player combinations to be successful, our focus is on being better every day. In the movie “The Amazing Spider Man 2,” a character says, “What makes life valuable is that it doesn’t last forever, what makes it precious is that it ends.” Similarly, what makes success sweet is to have battled through defeat and persevered. What makes personal victory rewarding is that it comes through fighting to create new habits and perfect certain skills. What makes us confident is that we’ve known doubt and decided to ignore it. I no longer question why those fans feel the way they do no matter what kind of game it’s been. I graciously accept the praise and know that the 11-year-old me would be proud of who I am today. It is all the aspects of the process that I attend to that make me successful, not any one goal I have or have not yet achieved. 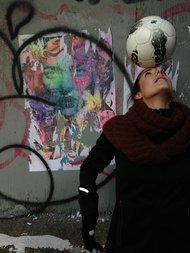 I often write about change — the constant fluctuations in my thought process and reinvention of myself as a person and a soccer player. My environment and situation are constantly in flux. This year in the National Women’s Soccer League is no different. Yet somehow, the path of progress is strewn with markers denoting the constants. Maybe more impressive than the ways in which I have changed over the years are the ways I have remained the same as I encounter each new twist and turn of the roller coaster ride that is my career and life. ■ I Am, and Always Will Be, a Perfectionist From the little girl kicking my ball against the wall at the schoolyard to the professional player I am today, anyone who has seen me train can attest that I have no tolerance for not getting it right. The evidence is in the many outtakes of my backyard skill challenges on my YouTube Channel. ■ I Have a Competitive Drive For the most part, this is a wonderful attribute. But like anyone who is extremely competitive, there are days that my rage gets the better of me. 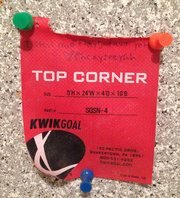 During preseason training with theWashington Spirit, we had a 4v4 tournament and I was quickly reminded that I have certainly not conquered this rage. After my guttural yell after losing, Ali Krieger turned to me. “Are you O.K. ?” she said, but her body language and tone were saying, “You have to be kidding with that reaction.” I ended up apologizing to my teammates for the outburst. ■ I Am Obsessed With Mastery From the first time I tried to juggle a soccer ball (my blowup “Lion King” ball that fell victim to deflation after I got frustrated and bit it) to this day, I am fueled and driven by striving for mastery. I train repetitions of mundane techniques for hours because I am always after that feeling of when it finally clicks. This obsession is often apparent when I am made to stop a drill in training before I or the team really gets it down. A feeling of fury swells up within me and often all I have to do is look at Lori Lindsey to know that I am not alone in my quest for that feeling of mastery. ■ I Am Single-Minded I always joke about how I’m not well-rounded. I am focused on a few, simple things in my life and that’s how I like to keep it. My parents used to urge me to expand my social life (“expand” is a relative term considering I had none) or try other sports. My decision on these matters was apparent on our recent team outing to the bowling alley. Let’s just say I would have hit more pins if I could have kicked the ball down the lane. ■ I Bounce Back Quickly Whether I have a setback or one with my team, I can’t stay bummed for too long. It’s as if my mind has a natural refresh button. 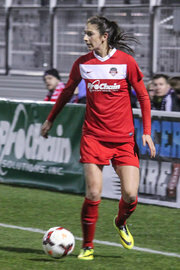 Our Washington Spirit season got off to a rough start with a 3-1 loss in our home opener to Western New York. I couldn’t sleep that night. I replayed the game over and over in my mind before actually watching it in its entirety at 4 a.m. All it took was getting back onto the field for that next training session and I had a different feeling. The motivation to be better and the energy of the team were contagious and the first game was erased, just like that. ■ I Love When My Parents Come Watch Me Play From my first soccer game, which had no goalkeepers, to this day, it means the world to me when my family and loved ones can watch me play. When my parents drove down from New Jersey for the Spirit’s home opener, it was the same. It doesn’t matter to me if I’m kicking around in a parking lot or suiting up for my professional team or with the U.S. women’s national team. Having my loved ones present to share my passion is everything to me. ■ I’m Sensitive About What I Do I have always craved and sought constructive criticism. As a person and a player, I need honest feedback to strive to be better than I am today. But that doesn’t mean I am not extremely sensitive at the same time. I care deeply about what I do and put a lot of time and energy into it. So when it doesn’t go as planned, the reality hurts. A lot. Whether it’s following our team’s first win against Kansas City or our loss on the road to the Seattle Reign, sometimes I dread watching clips of my performance. I have to be careful to strike a balance when I break down every aspect of my play — critique when it’s called for but also acknowledgment of what I’ve done well. ■ I’m Sentimental The reason I first started writing a journal was so that I could record everything I did and every thought I had at the time. I’ve always had a deep sense of gratitude and appreciation for what I’m experiencing, both the wonderful and difficult times. It is my attempt to make permanent what seems so ephemeral and it comes in many forms — a quote that captures how I felt in a moment, a song that reminds me of living in Sweden, and my writing exploring how I continually change but at the same time always stay the same. Sometimes I wonder when I watch veterans like Christie Rampone and Heather O’Reilly — does it ever get old? What does each game, meeting each new teammate and warming up for each training session feel like to a player like that? It dawned on me recently that I am now in that veterans category. I’m starting a season with my fifth professional club. And, no, it doesn’t get old, ever. Each time I embark on a new voyage. Seeking New Landscapes I can be at home in New Jersey, in Russia, Sweden and now in Washington. The landscape — the situation — is not what matters. Every preseason is somewhat the same, no matter which side of the world it’s on. You meet a new set of people, are exposed to a fresh slate in terms of results and are pushed mentally and physically to prepare for the grueling demands of a full season of games. The beauty is while it’s always much the same, each time it can also be vastly different. Having New Eyes As I begin preseason with the Washington Spirit, I look ahead with excitement at what’s to come in the 2014 National Women’s Soccer League season. Beyond the grind of weeks of double sessions — legs aching and sore, mind saturated with tactical ideas — is a full season representing a new club with new teammates led by a new coach. Most important, I finally have a teammate who sweats as much as I do. Thank you, Lori Lindsey! ■ I’m Not My Absolute Fittest I’ve always come into preseason at the peak of fitness, ready to push my body to its absolute limit and make a statement on fitness testing. Playing in Sweden opened my eyes to a different approach. There, the players take their short off-season off(imagine that!). Then they have a long preseason to build back into match fitness as a team. It’s nearly impossible to arrive at preseason in top fitness and then to maintain that throughout the entire season. It’s vital, however, to enter the relatively short and intense N.W.S.L. preseason with a solid base to be able to absorb the training load and avoid injury. My approach in this off-season was to work to get better as a player, not to prepare for preseason. Preseason is the preparation. ■ I Don’t Need to Be Best Friends With Every Teammate Playing for a college soccer team is the ultimate fakeout. I literally had 20 best friends who were all about my age and lived within two miles of me. So, naturally, I expected that every team would feel that way. It’s not that I don’t want to get along and share mutual respect with every woman on the Spirit, but I no longer feel the need to bond in quite the same way. I have some great friends on my team, and I enjoy time off the field with the group. But sometimes it’s nice to have friends who have different jobs and interests and can take the discussion away from the latest team drama and tactical concepts. ■ I’m Not Taking Total Responsibility for My Performance Because I’ve played in so many different environments and often trained on my own for months at a time in the off-season, I have often felt responsible for my own performance. Don’t get me wrong, what I produce on the field is absolutely dependent on my focus and work rate, and I will never allow those aspects to waver. But I’ve come to the point where I need help to get to the next level, and I am ready to put my development in the hands of others. I am trying to shift my focus away from myself and onto being a positive and valuable member of the team. I have bought into Coach Mark Parsons’s approach and will trust that he will provide me with the environment and feedback to improve and succeed. Similarly, I will gladly turn my physical development over to the strength and conditioning coach Kevin Boyle. I will always invest the same desire, eagerness and high standards for myself, but now I’m ready to accept help when it comes to the final product. I believe that if I invest my energy in the team, the team will buoy me. Once again, I find myself learning to strike a new balance in a familiar situation. When I step onto the field at the Maryland Soccerplex to warm up for our home opener on April 13, I will be facing a clean slate once again. Yes, for me this is a new landscape, but my new eyes are what make all the difference. As I am about to enter my fourth year writing about my soccer journey from the United States to Russia to Sweden and back home, I am often struck by the feedback I’ve received. Readers have related how some of what I have written affects them, and their comments have also given me new topics to ponder. They have all led me to consider why I do what I do. I considered what Kathy had said. What does it mean to have a calling? Does everyone have one or only a select few? How many people never find their calling? Or how many do, but it is disguised in a way that they don’t realize? I have a group of friends who often have conversations about their jobs and whether or not they are happy. A lack of fulfillment is often the cause of stress and a catalyst for conversation. I follow the discussion, but as I sit there, leg muscles aching with a sense of satisfaction from my day’s work, I realize I have nothing to add. I’ve taken for granted that although I have my ups and downs, I know I’m doing what I’m truly meant to be doing. Recently, I’ve started training with a couple of experts in the Washington area, and I wake up early every morning excited to get to work and motivated about what they are helping me achieve. I leave each technical session with Kris Ward with a renewed sense of how much better I can be. And I walk out of the gym after having worked on my strength, speed and explosiveness with Chris Gorres of Explosive Performance feeling exhilarated because I am unlocking my athletic potential. My friends discuss a simple formula to identify positive work (and life) situations. Think of the times at which you feel the greatest sense of achievement, productivity and joy. Then, using specific examples of those times, break them down to the most generic form of the activity or action that caused the wonderful feeling of success. This is the type of situation in which you can identify your calling and find fulfillment in nearly any field. I considered the application of this concept to my own life. I love to take a grand vision, a brilliant final product, and break it down to the basics — the most doable steps to achieve it. The idea of progress, maximizing potential, and doing so in a methodical way are almost addicting feelings to me. I am obsessed with the daily steps that give life to a far-off goal. That is why I always say how much I love the journey, and not just the destination. I agree that part of one’s calling involves the feeling that there is meaning beyond mere personal achievement. Every young player who refers to trying a challenge from my YouTube channel and every bit of feedback I receive about these articles are gratifying because they emphasize my connection to people through this sport, and the influence I can have by simply sharing my journey with others. I want people to feel, through witnessing and reading about what I do, that all dreams are attainable if you have a realistic timetable, and approach things consistently and efficiently. I agree. A calling doesn’t mean it comes easy and doesn’t mean it isn’t terrifying to go down that path. A calling resides in the things we are drawn to do for some reason outside logic and understanding. It is the processes about which we are passionate that come naturally to us. It is through our calling that we can make the most positive impact on the world around us. My calling happens to be not only playing the beautiful game, but attempting to share the nuances of my journey with those around me. I happened to intuitively know my calling when I was 9 years old. Some of my friends are discovering theirs at 27. And other people may find theirs much later in life. Some are able to make theirs a source of income, others find it in a hobby and still others’ calling is to be a parent or loved one. There’s no right answer to Kathy’s question, but everyone does have an answer. It comes in what excites us and terrifies us and makes our life worth living. 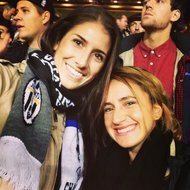 Yael Averbuch, 27, a native of Montclair, N.J., will be playing this coming season for the Washington Spirit of the National Women’s Soccer League. MONTCLAIR, N.J. — As I cleaned out my room before moving to Washington, I found a small piece of red fabric crumpled among some keepsakes. I have stacks of journals that catalog my thoughts, hopes, fears and dreams, as well as anything and everything that reminds me of my various adventures over the years. You could say I’m more than slightly sentimental. Writings, photos, objects and song lyrics all transport me in time. I held the red fabric in my hand and decided, for the second time, that it was one of the best gifts anyone had ever given me. The first time I thought this was in 2008, after the final game of my career at the University of North Carolina, when I opened a card from Casey Loyd (née) Nogueira and the red flag fluttered out. I’m a controlled person — in both my actions and emotions. I seldom lose my cool. I remember screaming at the top of my lungs when the ball hit the back of the net during the N.C.A.A. national championship game my senior year. Tears filled my eyes, and I started sprinting. No idea where. Anywhere. Everywhere. I fell onto a pile of my teammates and hugged them and continued to scream. In training, the aim was always to hit the red flag. Casey and I would show up at Finley practice fields in Chapel Hill, N.C., an hour before training started so that we could work on free kicks. If you hit the red flag, a roughly 2-inch-by-2-inch tag that hung in the top corner of each side of the net, you automatically won. In that final game, we were down, 1-0, against Notre Dame and time was running out. Maybe this is it, I thought. Maybe it’s just not our day. Then we got a free kick from the spot that was one of Casey’s specialties. I knew this from the hours we spent at Finley. As it landed perfectly where the red flag hung in our training nets, I lost my mind. At first I was bothered that Casey always wanted to join me in those training sessions. I like to practice free kicks on my own. I can get more reps and take them from exactly where I want to take them, with no one in the way. So I was mildly annoyed when Casey asked if she could come with me early to training, especially because I had to give her a ride. Over time it became a fun ritual, though. We would go early to the field and enjoy the time when it was just us and the bag of balls before everyone else showed up and the structure of training took over. There are some times in your life when you put in work and do all the little things right, and have nothing but faith that they will somehow pay off — maybe even in an unintended way. I have never felt more a part of a goal as the free kick Casey scored in that championship game. It was the goal that put us back in the game, renewed our hope, and allowed us to eventually win, 2-1. I finished my college career a national champion. It was one of the most special moments of my career. What I learned at U.N.C. is that success is never an accident. Winning is not about what happens the day of the game, when you leave it to chance. Some moments come unexpectedly. And some moments are born from a notion, a vision, that one day the tedious minutia that might be a pain today, will be incredibly worth it down the road. Thank you Casey. I keep this little piece of red fabric to remind me to have faith in that minutia. Sometimes when I’m facing uncertainty or upheaval, I try to think back to what I expected life to be like as a professional soccer player when I first made that my goal. The truth is, I didn’t think much about the actuality of the profession. 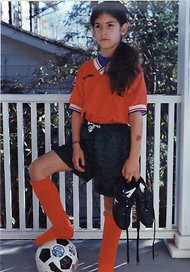 I remember when W.U.S.A., the first women’s professional soccer league in the United States, folded my father let me know that he would help to support me financially while I continued to pursue my dreams if after college there was no way for me to make a living playing and training. I think about that conversation often and how fortunate I am to be employed doing what I love. Being a professional soccer player has afforded me invaluable opportunities and adventures. But with the pros (pun intended) come some cons. There is a lack of stability that goes hand-in-hand with the lifestyle. I am in a continual tryout where I must prove myself. The discrepancy between where I am and where I want to be all too often bares its angry teeth and brings me to tears. I barely get settled in a place before upheaval strikes again and it’s time to move. Sometimes I wonder how I can possibly love this journey when the journey seems to be my most formidable opponent. It certainly can feel a lot less lovable than when I first coined that motto and jotted it down in my journal. I waited by the phone on Jan. 2, eagerly anticipating a call that would inform me to which N.W.S.L. team I would be allocated. Would I be staying close to home or moving across the country? Would I live in market only during the season, or want to stay all year and make it my new home? Who would be my next teammates? In the phone conversation with Commissioner Cheryl Bailey, the next chapter of my life was revealed. Once again, the excitement of a fresh start has me loving the journey. 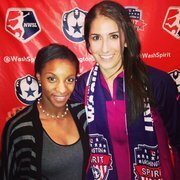 I am thrilled to be a member of the Washington Spirit! I will finally be moving out of my parents’ place and hoping to forge some stability in this tumultuous lifestyle. While I will no longer have my mom there to make my lunch, Spirit Coach Mark Parsons has been assembling a fabulous team and I have a lot of friends in the D.C. area. In the next few weeks I will pack up and move. I will be take my belongings — my U.N.C. pillow and Kopparbergs/Goteborg F.C. drinking glasses among them — but also the cumulative effects of my previous experiences and emotions. At times the journey has dragged me down, devastated and exhausted me, but I am never left jaded. My intrinsic inspiration keeps my spirit resilient and fuels my relentless fire. At times I may wonder how to love the journey, but it is this inspiration that makes the journey worth loving in the first place. All I need are a few momentary reminders. They come in the form of the excitement of a fresh start with the Washington Spirit; the courage it takes to not believe anyone who doesn’t believe in me; my disappointment that I’m not as fast as Sydney Leroux or as quick as Megan Rapinoe turned to sheer gratitude after seeing a woman in a wheelchair; a stack of essays that an under-11 girls’ soccer team wrote about me and my career. How can I not love the journey? 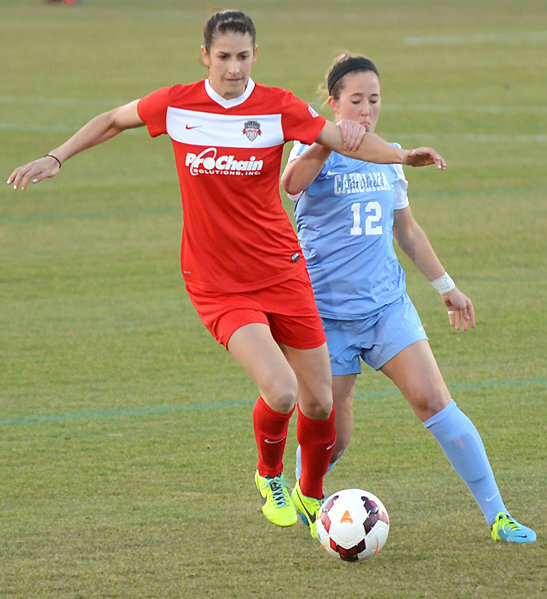 Midfielder Yael Averbuch, a native of Montclair, N.J., is part of the player pool for the U.S. women’s national team and now a member of the Washington Spirit of the N.W.S.L. “Here’s to the crazy ones — the misfits, the rebels, the troublemakers, the round pegs in the square holes. The ones who see things differently — they’re not fond of rules, and they have no respect for the status quo. …” — Steve Jobs “Christen! Knee over the ball!” Christen Press talks to herself in the third person on the field when her finishing isn’t up to par. Ali Hawkins, a fellow Tar Heel, ran every fitness session barefoot because that’s how she had trained growing up in Southern California. Heather O’Reilly rips off her shirt as a personal reward part way through the beep test (a grueling fitness test). She claims it helps her mentally to reach a few more levels. Christie Rampone never listens to music while running so that she can hear her breathing and be fully in touch with how she feels. Casey Loyd (née Nogueira) sometimes didn’t warm up at all, or decided to dance instead of stretch. But she could break into a full sprint and rainbow a defender at any moment she chose. The life of Steve Jobs makes me consider the fine line between craziness and genius. Like many who rip holes in the status quo, he was single-mindedly focused on a vision that, at times, only he could see. Many of my teammates at North Carolina, the professional level and now on the U.S. national team share the craziness that extreme drive and passion induces. In a physically and mentally intense training camp such as the one we just had with the women’s national team, players’ quirks and bizarre rituals become apparent. We are unique — from what we choose to eat, to how we conceptualize what we do, to our compulsive nature when it comes to training and competing. But exceptional individuals are just that: exceptions to the norm. I studied psychology at the University of North Carolina. In my Abnormal Psychology class, we learned that when certain personality traits cause serious impairment of function, then they become considered symptomatic of a disorder. But what about when some of those same traits lead to high achievement? Then we call it genius. If you study the D.S.M. (Diagnostic and Statistical Manual of Mental Disorders), you may notice that the distinguishing factors of several personality disorders — impulsivity, notions of grandiosity, preoccupation with ritual, perfectionism — also exist in the majority of high-functioning individuals. In this case, these traits do not lead to dysfunction and are not destructive. They are extremely potent tools for success. Sometimes you have to do crazy things to push your personal limit or the limits society dictates. Nothing about greatness is normal. And neither are the ones who achieve it. MONTCLAIR, N.J. — In 500 words, I’m about to logically explain why I do not subscribe to logic. When we are children, we believe that anything is possible. As we grow up, the world begins to be shaped by rules. 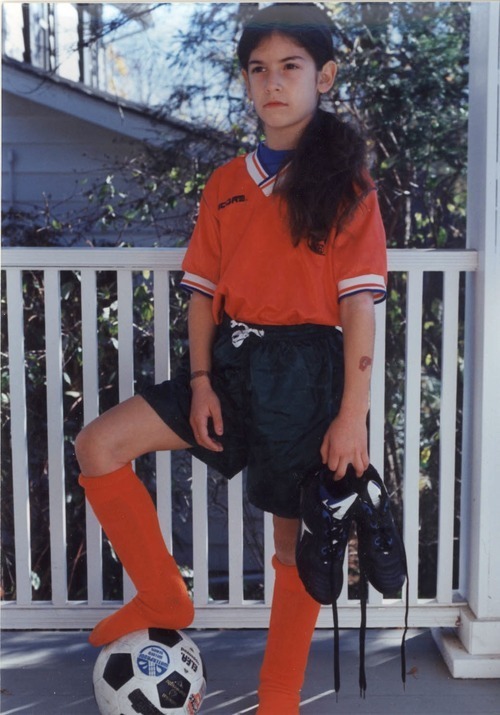 You are a girl, so at a certain age you should no longer play soccer with boys. You are not fast or aggressive enough to succeed playing for the women’s soccer program at the University of North Carolina. That trick with the ball is impossible. You shouldn’t devote all your time and energy to soccer because you will burn out from the lack of balance. All of this is logical, but all of this is wrong. I’m laying in the same bed in my parents’ house in which I slept as a 9-year-old. I’m 27. No home of my own home; I have a job that is incredibly unstable; and I get paid to play a game. I am on a continual mission to find fulfillment from a journey with no destination. None of this is logical, yet all of this is right. Throughout my career, I’ve had to make tough decisions. I opted out of playing for my high school team to train with boys’ teams. I decided to play for a college program that didn’t suit my playing style, and that I knew would be an incredible challenge. I chose to leave my hometown team, Sky Blue, after two seasons in Women’s Professional Soccer (W.P.S.) to play for the Western New York Flash. Then, in the absence of a women’s professional league in the U.S., I traveled to Russia and then Sweden to continue my career. When the N.W.S.L. was announced, I decided to stay in Sweden instead of terminating my existing contract to return for the inaugural season of the new league. Most recently, I decided not to re-sign with my team in Gothenburg, Sweden, and return to the U.S. to play in the N.W.S.L. for the 2014 season. “If you do what everyone else does, you will get what everyone else gets.” This clichéd quotation has become my truth. None of the situations I’ve faced have correct answers. And I don’t live by logic because passion has the power to trump logic. Sometimes you need to let yourself believe in the possibilities rather than protect yourself with the realities or patterns that have come before. If you buy into what’s logical you’ll only prove those previous patterns right. It’s when you step outside the norm that the most extraordinary things can happen. When I lace up my boots there is no room for logic. After Cristiano Ronaldo’s third goal against Sweden in the World Cup qualifying playoffs in Stockholm, the camera panned the crowd. The Swedish fans had a look of despair. It wasn’t even anger or frustration, simply pure despair. It was what I imagine the ancient Greeks looked like in myths when tragedy struck at the hands of the gods — pained, but resigned to the fact that the destruction was not the work of an Earthly power. It is the same look that I have often seen on the faces of defenders in Spain’s La Liga, as Barcelona’s Lionel Messi glides past a perfectly shaped defensive line in one slaloming dribble. There is nothing to be done but accept the circumstances in awe. There are players that seem to defy the human realm of ability. Even on the world’s biggest stage they can dominate with seeming ease and alone change the course of a game. So who — between these two gods among men — is the best in the world: Ronaldo or Messi? My experience has led me to believe that every athlete falls somewhere on a spectrum of ability when it comes to those qualities. With that innate ability as a starting point, every area can be focused on and improved to a certain extent. Whereas I may not be blessed with the same speed or agility as some of the top female soccer players in the world, I have gifts in the other areas. I have a good sense of how to train and can spend hours on a task without getting bored or distracted. This is as much of a talent as a good time in the 40-yard sprint. Ronaldo makes more sense to me as a player. He does moves that we all learn as youngsters, albeit combining about 47 of at a time. He makes runs that we have seen drawn up on chalkboards. He finishes using the techniques that coaches have players practice in drills. He does all of that better than anyone else. Ronaldo has proved himself effective in multiple environments, with different teammates and under different managers. Messi has yet to do this to the same extent. Ronaldo has obvious physical gifts, but his greatness has been honed through purposeful repetition. This is something that is logical and familiar to me. When I watch Messi, I see something more innate, something almost beyond what can be verbalized. Messi’s movements are not trained in the weight room or with an agility ladder. His dribbling is not composed of moves that can be taught by a coach. Even his finishing is often not something he could have trained with repetition on the practice field. He is, by all definitions of the word, an instinctual athlete (not to say, of course, that he doesn’t work exceptionally hard in training). I cannot say that Ronaldo or Messi is better than the other. They both illustrate the inevitable combination of an inherent gift with the characteristics and circumstances that enable them to excel. There is no single ingredient that creates greatness, just as there is no single definition of greatness. I am simply more in awe of what Messi displays, because it is beyond my logical comprehension. He brings the game to life in a way that challenges my imagination. 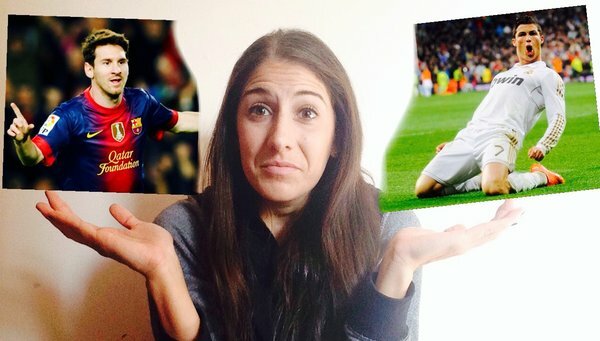 I appreciate both of their talent, but if otherworldly, inexplicable greatness is a determining factor, Messi gets my vote. Coffee is a way of life in Sweden. It is not simply a beverage you grab to go, or something used for a jolt in the morning. Coffee is an experience. Particular aspects of Swedish culture have made me aware of how inherently American I am. I am never satisfied — always looking to do more or find methods to do things better. In many ways, this is a wonderful quality and has been the backbone for my career. But I’ve learned to couple this with a bit of Swedish mentality, which also can be extremely beneficial. I have learned this through coffee. What I’ve come to enjoy about Swedes is that there is rarely any rush or agenda behind their coffee drinking. A coffee is taken (as they say) after every meal and is often included in the price of the meal. Most Swedes drink their coffee black, or with a touch of milk and/or sugar. It is not convoluted by cream, excessive sweetener or flavoring. This experience is similarly wholesome — typically not marred by any planned purpose or urgency of any sort. As an American, I had been accustomed to getting coffee to boost my energy during a day packed with activities. Or sometimes I would plan to meet over coffee to discuss business or catch up with friends. In Sweden, I’ve come to relish the art of what is called fika. Fika, as a noun, refers to the combination of coffee and usually some sort of sweet snack. But fika, as a verb, is the act of partaking in a Swedish social institution. My soccer career has been nothing short of a roller-coaster ride. Because I am so heavily invested, every success or momentary failure can wreak havoc on my mind and spirit. I have learned in some ways to thrive on the tumult, but in other ways the upheaval takes a huge toll. The fika experience is a time of stillness amid my roller-coaster ride. I used to go sit in a coffee shop to write, or check things off from my to-do list. But the true nature of the fika is to enjoy time and company with no plan or purpose. To fika is not to do, but simply to be. At times, living abroad was tough. It can be excruciatingly lonely to uproot your life and settle in a new place. In addition, the second half of our season at Kopparbergs/Goteborg was difficult, to say the least. We had a number of disappointing performances, a team wracked with injuries and illness, and our coach (Torbjorn Nilsson, who is highly respected and who coached at the club for six years) announced his intention to quit with a few games left. I recently arrived home from Sweden with a day to spare before being thrown into yet another emotionally turbulent environment: camp with the U.S. women’s national team. The life of a professional soccer player does include ample free time, but I realize more and more that the mind is never at rest. When I’m off the field, I often replay training or game situations again and again or visualize future ones. These situations have led me to appreciate some things I typically might overlook in a more comfortable situation or when everything is running smoothly. I have learned to thoroughly enjoy the company of good people, for no other reason than to enrich my life and feel the joy of their companionship. I have learned to shut off my inner drive and personal angst temporarily. And I have learned, over a cup of coffee, for even a brief time to stop doing and to enjoy just being. SAN FRANCISCO — In the sports world, the history of the United States women’s national team is the equivalent of a fairy tale. The team has completed seemingly impossible comebacks, maintained ridiculous winning streaks and featured moments of individual brilliance. 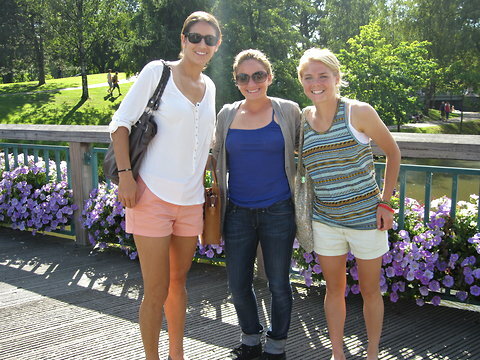 U.S. women's national team players, bottom from left, Christen Press, Yael Averbuch and Heather O'Reilly; top from left, Whitney Engen and Jillian Loyden. I am often starkly aware that I’m participating in something truly amazing, yet at times incredibly challenging and humbling. After all, the participants in this fairy tale are still human. We Cry I have lost count of how many times this environment has seemingly broken me. There have been days when the stress and repetitive failure has overpowered my ability to enjoy playing and stripped my motivation. But in those times I am surrounded by some of my best friends and people who find ways to support me and hoist me back up when I can’t do it myself. If only I had a dollar for every time Whitney Engen has seen me break down and has provided a voice of reason. Or there’s Heather O’Reilly, who has encouraged me and made me feel valuable even when I couldn’t see my own value. A kind word or supportive comment at training from Carli Lloyd reminded me that I’m not crazy when I think that I can achieve what I’m after, but it feels like I’m fighting an uphill battle. There is no level of success that eradicates moments of doubt, disappointment and despair. But there are no people I’d rather be around in those moments than these. We Laugh In the soccer world, there is no moment too serious not to find some humor. Whether it’s a Vine video that Sydney Leroux shows at dinner, Lauren Holiday (nee Cheney) making fun of her defensive abilities in a video session, or someone goofing around with Stephanie Cox’s baby daughter, the sound of laughter prevails in training camp. Although we often roll our eyes at his sense of humor, Coach Tom Sermanni likes to make light of things and even jokes with us about mistakes in training or games (which sometimes makes us cringe before we realize we are allowed to take a breath and relax). Laughter is about survival. It brings joy to an otherwise tense and stressful environment. There is nothing funny about this group’s goals and ambition, but we certainly don’t take ourselves too seriously. We Love When you care so deeply about what you do, and fully invest in it, you leave yourself exposed. For this reason, many of us have formed extremely tight bonds with one another. We have seen each other play and develop over the years. We have witnessed one another’s ups and downs, seen each other get engaged, married and have children. We live together for weeks of intense training and talk about our hopes, fears, dreams and spiritual beliefs. For these reasons, we share a love that is like no other bond we will share in our lives. My teammates have seen me naked — in the figurative sense, not just in the shower — and accept me for who I am. And I love and respect them for that. We Compete Competitive by nature is an understatement. This is the kind of environment where a player’s day is made or broken by a small-sided game in training; people slide during technical drills to try to make it work properly or save a stray pass; and card games in our spare time turn into fierce battles and weeklong arguments. Everyone here wants to be the best, and everyone is really good at what they do. What I’ve realized is the best way to compete in this environment is with myself. This is the hardest working, most talented group of women I think I will ever encounter. We each bring a set of qualities to the table that is unique, and we must mold it to fit within the framework of the team. My job, and all I can control, is to make my skill set as potent and effective as I possibly can. So while we scrap and fight to win in anything and everything possible, my real competition exists internally. Those of us fortunate to don the U.S. crest are privy to an environment like no other. This group fosters greatness, but simultaneously maintains a tough and grueling blue-collar mentality. The success is composed of individual efforts, yet the feeling of cooperative momentum is overwhelming. Competing within the team is fierce, but fosters some of the closest bonds that life can offer. These paradoxes drive a level of success that is unparalleled in almost any field. At the end of the day, we play for our country, but we cry, laugh, love and compete for one another. GOTHENBURG, Sweden — I am often asked if I am like so many other Americans who think Europe is one big country and who do not bother to differentiate between its various nations and cities. Ah, no. I do realize Europe is home to a variety of people with vastly different lifestyles living in vastly different cities. And as an American in Europe, I have noted an aura that sets this place apart from any American city and from other places I have visited. My experience living in Gothenburg has been distinctly European. The European identity can be felt in the coffee shops, the baked goods, the fashion styles and the music played. It permeates the faucets, the doorknobs and the light switches. Even the beds have a European identity. It also crops up in traffic patterns and laundry systems, in locker rooms and teammates’ hairstyling techniques. It supersedes language or nationality. It is a general way of being. And a large part of that way of life is defined by football/soccer. Football culture is pervasive in the lives of most Europeans in a way that would possibly best correlate to “Monday Night Football” (American football, that is) in the United States. Not everyone follows it, but it runs deeper than the game. It is generally not easy to move somewhere new and create a life for yourself that is rich and meaningful. For me, football has been the tie that binds. It is the driving force behind so many moments that have shaped my journey and will forever change how I view the world. A couple of weeks ago I walked with my American teammate Cami Levin among thousands of fans in Copenhagen. We navigated the cobblestone, slowly leaving the lights of the stadium behind us. But the images of the game we attended remained imprinted in my mind. I will not claim to be a true Juventus supporter, but I have followed the team for the last few seasons and jumped at the chance to see them face Copenhagen in UEFA Champions League. Copenhagen is a three-hour drive from Gothenburg, so when the club rented a small car for us about a week before the game, I quickly learned to drive the manual transmission in preparation for the trip. Nothing like true motivation to trump my fear of changing gears through the city while navigating trams, buses and cyclists! I insisted that we get to the stadium an hour before kickoff so we would not miss one minute of the warm-up. I watched, in part, as a professional admiring the proficiency and speed at which the men were performing the same skills I train every day. The other half of me was just a participant in a much bigger scene, though. I was taking part in the experience of total football immersion. On game day in Europe, people stream in from the streets of the city to the stadium, rather than tailgating in a huge parking lot. During important competitions you can hear cheers as you walk by sports bars on the street. After the game, my Juventus scarf raised questions and started conversations in the tiny restaurant where we ate. I felt not like an outsider, taking in this spectacle, but instead like a European sharing in a communal experience. It has taken me nearly a year to feel like I live in Gothenburg, but slowly my extended soccer trip gave way to what I consider a new home. I have bonded with teammates from parts of the world that once seemed like only blips on a map, watched games live that were usually events only TV channels could connect me with, and lived my life in a way that never would have been possible for me in the United States. Once more, the game I love has enriched my existence in ways I could not have dreamed. 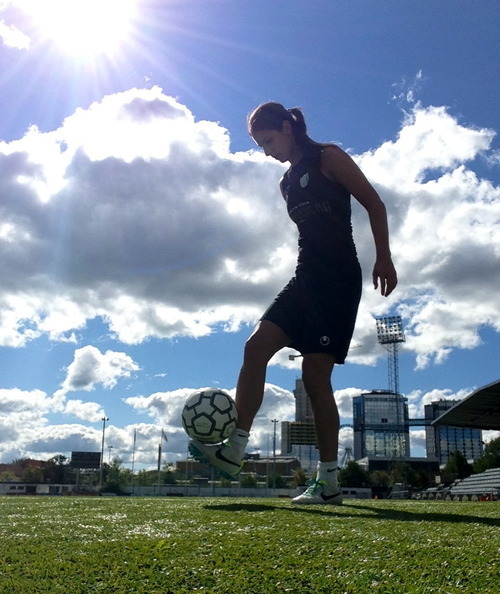 GOTHENBURG, Sweden — Last month, I lay in bed in Sweden with my computer tuned to the inaugural championship game of the National Women’s Soccer League. It was 2 a.m., and through sleepy eyes I watched the starting lineups walk out in Sahlen’s Stadium in Rochester. I couldn’t help but reminisce about my last professional game in the United States — played in that same stadium — the 2011 championship game of Women’s Professional Soccer. As the Portland Thorns celebrated the championship, I watched on the screen from a different place — literally (across the world in Europe) and mentally — than when I celebrated on that field in 2011 with the Western New York Flash. Since then, I have played for three different clubs: one in Russia, a W-League team in New Jersey and now for Kopparbergs/Goteborg in Sweden. All of a sudden, the new American league seemed foreign to me. As an outside observer, the coverage of the N.W.S.L. has been excellent. The games have all been available for me to follow, although I have only caught a handful because of the time difference. As much as I do know about the league, I’ve realized there are a lot of areas in which I am out of the loop. Many of the players I know well and have played with over the years, but there were also some unfamiliar faces. Since I played in the U.S., there are also two new franchises — the Thorns and the Seattle Reign. Playing in W.P.S. was my first professional experience, so I didn’t have much with which to compare. Now, as a slightly more experienced professional, my observations of the N.W.S.L. 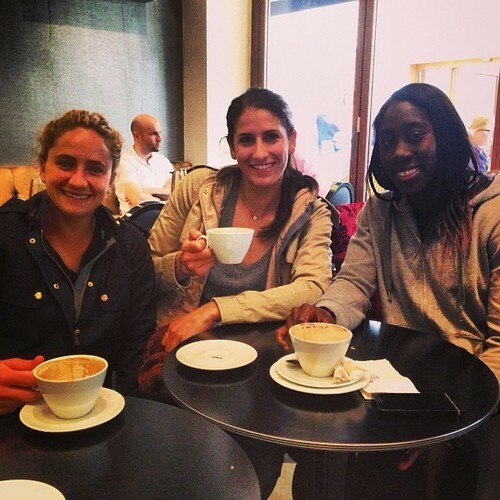 are influenced by my feel for European women’s soccer and how the game is growing globally, in addition to in the U.S. In Sweden, while there is fantastic support for the women’s game, there is a different emphasis on marketing and attendance. Damallsvenskan (the Swedish women’s league) games have much smaller turnouts than the numbers I was seeing in N.W.S.L. game reports, but, for the most part, the teams here do not rely on ticket sales as a source of income. Most clubs have a number of local and corporate sponsors who support the team regardless. Hence the extreme number of logos on most Swedish team uniforms, sometimes including ones on the posterior of the shorts. I am hoping to watch the N.W.S.L. sustain itself and flourish over the coming years. Playing in Europe has opened my eyes to how the plans need to be long-term. Teams in Sweden and in Europe have gradually developed a culture, style and system of play. It’s something I really appreciate about playing abroad and hope to see take place in the U.S. In Sweden, there is a promotion-relegation system with a second league, Champions League spots to aim for and the Swedish Cup. Every team has something to fight for, regardless of its standing in the 12-team first division. This has taken time to evolve, but I’d love to see professional women’s soccer in the U.S. reach that point down the road. 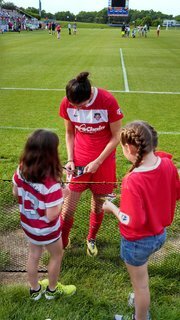 Seeing the photos of the Portland Thorns celebrating their title took me back to 2011, but also took me forward in time with hopes that the league will continue to provide playing opportunities for American, Canadian and Mexican players, and also begin to expand to attract players from elsewhere in the world. It is an impressive league with wonderful talent and dedicated fans. With my added perspective from playing in Europe, I realize how much N.W.S.L. is truly in its infancy. As Americans, we always look to quickly make things bigger, better and more successful. Like most invested followers and participants, I think there should be some tweaks made to the N.W.S.L. to continue to improve from season to season. After playing elsewhere, however, and seeing that even the leagues with great history and parity are not perfect, I have come to the conclusion that the N.W.S.L. 's opening season was a success. GOTHENBURG, Sweden — From the moment my dad bought me my first pair of cleats (he actually called them spikes, thanks to his running background … at least he didn’t call them boots) and shin guards, I have been bombarded with instructions and advice. Some things I’ve learned from coaches, videos and various experts have stuck with me over the years, and others I’ve chosen to throw by the wayside. In the spirit of my love of lists, here’s another! Photograph by Per MontiniThe writer playing for Gothenburg, which beat Malmo, 2-1, in a recent Swedish league game. ¶ Warm up like you’re going to play the game. I’ve found that I prefer to expend less energy in warm-up and just make sure that my muscles are loose and my mind is free. I play best when my body is ready to go and I’m happy, so usually, in terms of a pregame routine, this means less is more. I like when a team warms up with possession or some sort of actual playing, but I am not going to go all out and try to feel the intensity of the game just yet. That may work for some people, but it’s not how I prepare. ¶ Decide what you’re going to do with the ball before it comes to you. Yes, it’s good to have your head up and have a picture of the field in your mind as the ball travels to you, but I find it’s best not to make a decision until it’s at your feet. This might mean a split-second decision if you are going to play one-touch, but it’s not an early decision. I find that the later I make my decision, the more information I can process about what has changed on the field. Also, this makes the game less of a thinking game and more instinctive. I have a good feel for the rhythm of the game, so I like to rely on that instinct as opposed to my mind doing the work. ¶ Avoid caffeine before the game. I like to have a coffee, or two, before I play. I hydrate well and try to get plenty of sleep, but I feel that some caffeine gives me an extra edge in terms of energy and focus when it comes time to play. Coffee has a large effect on my mood. Plain and simple, it makes me happy. And who doesn’t want to feel happy before playing? ¶ The most important thing is to have fun. Hands down, this is my one key to success. I play much better when I’m relaxed and enjoying myself, and I enjoy myself when things are going well on the field. They feed off each other, but the one thing I can control within the cycle is to find happiness in the little things. Whether it’s something funny that happens on the field, a good combination with a teammate, or the simplest pass that zips along the grass, I try to appreciate those moments. I don’t think I’ve ever played poorly in a game when I was in a good frame of mind and enjoying myself. Photograph by Gloria AverbuchIn Montclair, N.J., 8 years old or thereabouts. ¶ Have orange slices at halftime. I sweat a lot and find that I not only need to drink a lot of fluids, but also have a snack at halftime. Fruit, gummy bears, a granola bar all work. The little bit of sugar helps to replace some of what I’ve lost in the first half, and also keeps me focused and energized. I would love it if there were always orange slices available, but unfortunately that ended at about age 12. ¶ Don’t be afraid to make mistakes.Especially as a center midfielder, it’s easy to get down on yourself if you make a few mistakes. It can be scary to demand the ball when you’ve just given it away in a dangerous area. But since I find that being in that position puts you constantly in the middle of the action, I’ve started to view mistakes differently. My philosophy is to do more, and do it well, so mistakes matter less. Rather than attempting to limit mistakes, which sometimes I can’t control and trying can make me tense, I demand the ball as much as possible and always be available as an outlet. That way, if I am constantly involved and do tons of good things, the times I don’t do as well are far less important. I’ve long outgrown that first pair of cleats and now prefer shin guards without the attached ankle guards. It’ll be interesting to look back some years from now and see what advice I’ve continued to covet and what new take I have on the pieces that I will chuck along the way. The other day, my team (Kopparbergs/Göteborg FC) got crushed 5-0 by LdB Malmö. Even worse than the score-line was the feeling of being completely dominated and ineffective at something you train for every day. Although everyone hopes life’s highs outweigh the lows, we have all traversed the valleys as well as the peaks along our journeys. I can’t control everything about my life as a professional soccer player. I may have to switch teams/cities each season, or even midway through a season. I may play 90 minutes or notstep foot onthe field. I do all that I can to stay healthy, but I may miss time due to injury. Coaches or observers may love my style or performance, while others may criticize it harshly. My team may prepare thoroughly for a game and still lose or I may be subjected to a system of play or method of training with which I don’t personally agree. But to refer to a Victor Frankl quote that encapsulates one of the University of North Carolina women’s soccer team core values, “Everything can be taken from a man but one thing, the last of the human freedoms—to choose one’s attitude in any given set of circumstances, to choose one’s own way.” Frankl’s analysis came from his experience in a concentration camp, which he describes described in his book, Man’s Search for Meaning. Surely we can all manage to stay positive with the much smaller obstacles in our daily lives. Like the years I’ve spent honing technical skills and physical fitness, mental training for me is an ongoing process. And every time I think that I’ve arrived at a new epiphany, something eventually shakes my mindset. My confidence, contentment, and courage are constantly put to the test. At the end of the day, it’s terrifying to do your best and possibly still come up short. And sometimes it feels that failures outnumber successes along the way. I often bring my focus to my development as a player and a person. As long as I feel that I am still getting better, then I know I am on the right track. I am no longer considered a “young” player. But I still feel that I can be so much better and more dominant than I am. I hold onto thatdissatisfaction and the notion that there is another level of play within me that inspires me to keep pushing. During the Swedish class that I recently started, I observed a personal characteristic that has played a large role in molding my journey. It is the way I learn. I have an obsession with mastering the basics. My mind and body will not let me move forward until I feel that I have fully grasped the foundation of what I’m doing. Sometimes it can make me feel like I’m getting off to a slow start, but philosophically, I believe that the wider the base you are able to build, the higher your pyramid of learning can reach. When learning Swedish, I have been obsessed with fully understanding not onlyhowthings work and are said, butwhy. I have trouble making myself try to speak until I understand exactly what words I am saying and why they fit together the way they do. I’m slow, but making progress. Jag pratar lite Svenska! 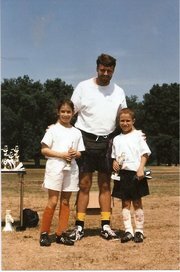 Soccer has been the same for me. I have spent years mastering basic techniques and building my platform of physical fitness. Whereas other players maybehave more game experience or less fear to just try things in the moment and make mistakes, my approach has held me back at times from doing that. That’s why I feel that, at 26, I am just entering the period of my prime playing ability. I still work incessantly on building my base, but at the same time I am now adding other elements to my pyramid to help take it to new heights. I have and will hit many stumbling blocks along the way—individually and team-wise—but as long as I continue on my ascension, I feel great about the process. After all,with this philosophy, I can always control my own improvement. 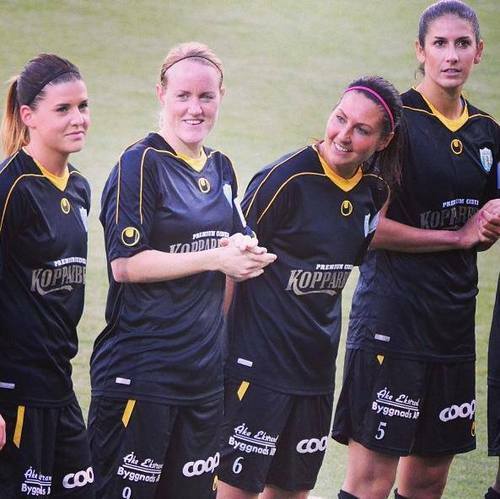 Season update: Kopparbergs/Göteborg remains in third place in the Damallsvenkan (Swedish women’s league). I will be traveling back to the U.S. for a week to represent the USWNT against Mexico in DC on September 3. We still have eight games left in the season and also Swedish Cup games to be played, so there are many chances to avenge our recent defeat! GOTHENBURG, Sweden — I’ve seen the quotation above dozens of times, but recently it struck me with renewed meaning and strength. Perhaps it’s because I am beginning to unfold a phase of my journey in another country. Suddenly, my habits don’t seem quite as normal as they used to, and I am being exposed to new ways of living. Gothenburg is a wonderful city. It’s beautiful, there is a lot going on, and everyone is friendly and speaks English. The transition has not been a tough one. As my days here pass and I no longer feel like I am on vacation, however, the process of adapting to actually living here has taught me some things about myself, cultural influences and life in general. We are what we repeatedly do. I first noticed this on the field. The Swedish women on Kopparbergs/Goteborg are impressively proficient in possession. Whether it’s 5 v 2, one touch, whatever the restriction or dimension, it’s normal to connect 10 passes (which is often typically the aim once or twice for the entire time playing when I’m back home). The players have mastered the techniques and decision-making to make games like this feel easy. Interestingly, though, a simple American warm-up series of traps and volleys (which you would think would be a breeze) seemed challenging when I watched my teammate Christen Press try to teach it to one of our more technical Swedish teammates. It has nothing to do with the players’ ability. We simply become proficient in the things that we make habitual. I enjoy bike riding, but my quads don’t. After a few days here, the club bought bikes for Cami Levin and me (the two new additions to the team). They are both purple and have baskets in the front, and little bells to alert other bike riders when we are approaching, which is typical here. I loved my bike from the moment I saw it. And riding it on a sunny day to and from practice was fun! After two days of bike riding everywhere, though, my legs were heavy and tired. I’ll have to ride the tram instead on occasion until I get used to this new additional exercise. 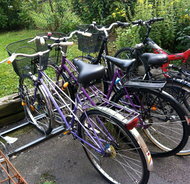 The club bought purple bikes for the author and a teammate. The No. 7 in Swedish is physically impossible for an American to pronounce. I am not fluent in any other languages, but I consider myself decent at picking them up. I am usually fairly good at pronunciation, especially when I am just repeating after someone. But I am not confident I will ever be able to speak Swedish. I have hope that maybe one day I will be able to understand it, and even possibly read some, but there are sounds in this language that are impossible! If you are American, and have mastered being able to say “seven” in Swedish, please contact me (my Twitter address is below)! I may request a Swedish lesson over Skype. Check out how to say some difficult words in Swedish here. Swedes have a different attitude toward work. In my two weeks here, I have noticed that while the Swedish people I have met and observed are hard-working, they have a much more laid-back attitude toward work than I am used to in the U.S.
On and off the field, quality is valued over quantity, and enjoying what you do is top priority. Training is always just enough or leaves me motivated to do a bit more. Efficiency is valued on the field, but Swedish people also much appreciate their free time. On a nice day, many people are out relaxing in the park, getting coffee or lunch with friends, or walking and biking around the city. I could definitely get used to this! “Do not expect rewards for football, football is the reward.” I saw this written somewhere and immediately loved it. What a wonderful reminder. I have come to Sweden to learn, add pieces to my game and help bring me closer to my goal of playing in a Women’s World Cup and Olympics. But what is most important is that I enjoy every day here and treasure each time I get to step onto the field. I laugh a lot at practice, even though half the time I don’t understand much of what is being said. I believe that when I am truly and wholly happy playing this sport I love, and only focused on doing my best in the training session or game, then my dreams will find me. I counted in my head, “Nine…ten…eleven. Nine…ten. Nine…ten…eleven…twelve. Come on, Yael, close the gap to 19!” Marlene “Marre” Sjöberg had changed her method of beading and I had no time to stop to improve my own system. She had overtaken me. For over an our, the two of us sat forward in our seats at the table, beading bracelets with the fury one might use to restart a manual car that has stalled just as the light turns green (which is becoming an all-to-common fear for me here as a new manual driver, but that’s a story for another day!). The rest of our teammates sat back, chatting, sipping water, and beading their bracelets, sometimes even taking time to make patterns with the multicolored beads. My Swedish team, Kopparbergs/Göteborg FC, had gone on an outing to a local charity called Ung (Young) Cancer. The organization provides support for youth who are affected by the disease, either directly or indirectly, and sells bracelets that say “F*CK CANCER” to raise money for the cause (www.ungcancer.se). 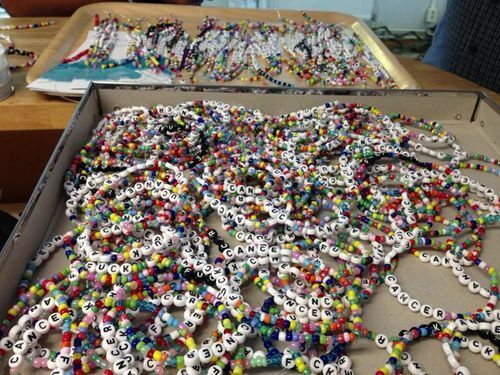 All I heard was that we would bead bracelets for two hours— each one 19 beads, the letters F-*-C-K, three beads, C-A-N-C-E-R, and then 19 beads again—before I furiously got to work and naturally was well aware of my production rate in comparison to everyone around me. So much for a relaxing afternoon of bracelet-making. I hadn’t beaded a bracelet in years. The irony of the situation was that this is exactly how I would have approached the task as a seven-year-old. Growing up, there was always concern that I should be more well-rounded. My parents and I were constantly warned that it was dangerous or unhealthy for me to pursue soccer as single-mindedly as I was doing at such a young age. But with beading bracelets, or anything for that matter, I was just as fanatic. The truth is, I’m not well-rounded at all. In part, because I approach everything I do with the same intensity. That’s the only way I know how to do things or find them exciting. I can’t really do anything “just for fun” because what makes it fun to me is the tension of always trying to do it better or be the best. Still, seeking this ever illusive “balance” that I’m told is so important in life has been an ongoing process for me. Although counterintuitive to the very essence of my being, balance is necessary for me to have the mental longevity to play soccer at the highest level for as long as possible. Besides my everyday reminders that balance is just not for me—for example, my inability to focus on a TV show without feeling I should stretch or foam roll or do something productive—my experience at Ung Cancer made a stark statement about my nature. While I seek balance to help relieve some of the constant angst that tugs at me to maximize my potential, my intrinsic way of being usually wins out. I guess the irony of balance is that it is actually a very fine tension. It is the pull between the necessary forces of contentment and ambition, cooperation and competition, catering to your strengths and giving energy to improve your weaknesses, being in the moment and planning for the future. I am absurdly focused, insanely driven, obsessed with perfection, and every other quality that if not applied to a valid discipline would end me up in a psychiatrist’s office as opposed to a soccer field. Part of finding balance in my life has been to have friends outside of soccer, spend time doing non-competitive activities, and expand my mind to new and unfamiliar areas. Finding the ideal tension between those elements and my inherent nature is an ongoing process. And, although I am making progress, in the heat of the moment balance often gets thrown out the window. As Marre and I furiously made bracelets, the only thing balanced about the situation was the number of beads on each side of the letters. 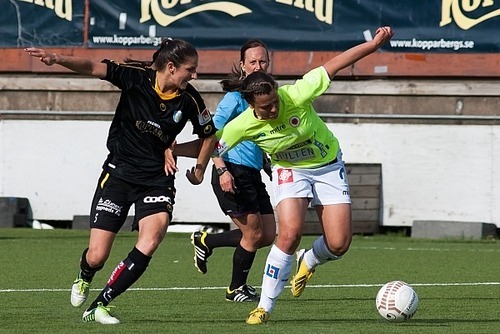 Season update: Our team is two games into the second half of the Damallsvenskan (Swedish league) season. We have two wins, most recently 1-0 away against Mallbacken, and face LdB Malmö at home on Sunday. We are currently sitting in third place with 26 points, just behind both Tyresö and Malmö with 30. I returned to Sweden from my summer break just a day before the opening games of Euro 2013. During the tournament, I was able to take in three games live and watched most of the rest on TV. Since all the commentary was in Swedish, and I’m removed from what’s being said about the tournament in the U.S., I developed some opinions on the action that may or may not be shared by a lot of people. Sweden is awesome. Something that has really amazed me and pleasantly surprised me since coming to Sweden is the country’s respect for women’s sports. Newspapers feature articles on the local teams, TV covers a lot of games, and fan support is impressive. While most times there aren’t tons of people in the stands for club games, everyone around the city is aware of their local team. I was lucky enough to be in Göteborg for two games that featured Sweden and all day the city was filled with yellow and blue shirts. Both games sold out the stadium and had an attendance over 16,000 supportive fans proudly chanting and waving Swedish flags. 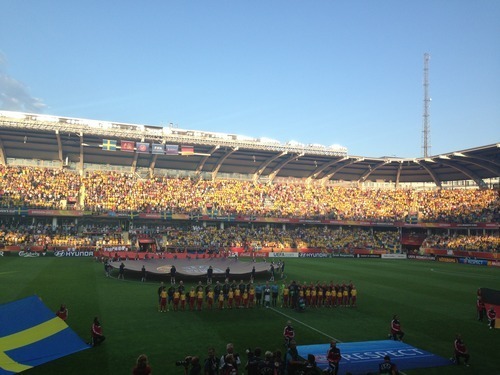 The championship game, although Sweden was no longer involved, had a record attendance of 41,301. I’m not Swedish, but was sure proud to be a temporary resident of a country that appreciates and supports their women’s fotboll. The gap is closing. What struck me most about the entire Euro 2013 tournament was the fact that no victory was ensured. In the past, it would be a no-brainer that Germany would crush Holland, England would run easily over Spain, and France would glide past Denmark in a quarterfinal game (all results that did not pan out). But while the top teams continue to rise and refine their system of play, everyone else is closing the gap with leaps and bounds. Denmark, who did not finish top two in their group play but received a wildcard into the quarterfinal, impressed me as much as any team I watched in the tournament. Norway, currently ranked 11th in the world by FIFA, surpassed three higher-ranking European sides to feature in the final. For periods of the match I thought they outplayed Germany and easily could have taken the championship had they capitalized on the two penalties called in their favor. All in all, no team in the tournament could be counted out. All showed very bright moments and made a case for the increasing parity in the women’s game. Spain is to be feared. My personal favorites to watch this tournament (and I know I’m not alone is saying this) were Spain. 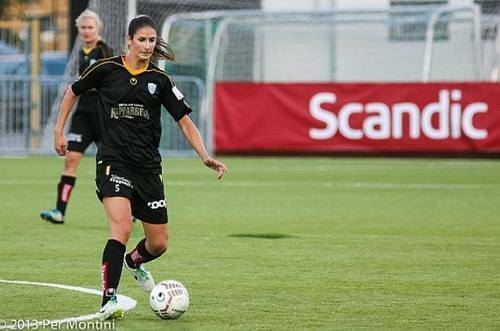 I often face Verónica Boquete and Jennifer Hermoso, who play for my Swedish club’s rivals, Tyresö FF, so I am aware of their extraordinary individual talent. What surprised me was how well Spain played as a team. Not only do they have individuals who can break pressure and create a dangerous situation in a split second, but they move the ball well and with good rhythm. I had no illusions about how far they would go in the tournament. I don’t think they have the depth or physical strength yet to push through the later rounds against tough competition. But Spain is to be feared in years to come. They are a few players away from being one of the top teams in Europe and as they gain confidence and eventually increased resources and support from their federation, I think they have the potential to challenge as a top team in the world. Winning is a habit. Everyone had been talking about how Germany had injuries and was missing some top players leading into the tournament. They brought a younger team than usual and were visibly not the same powerhouse we’re used to seeing. I thought that Sweden outplayed them in the semifinal in the run of play, but were unfortunate to not do better finishing some chances on goal. And Norway could have easily been victorious based on their chances in the final. But Germany know how to win. It is an intangible skill in the game that has nothing to do with possessing the ball, creating quality scoring chances, or even the talent of the individual players. Yes, these factors are all important and it is very unlikely that you can win a major competition without them, but Germany was not the best team in Euro 2013 in my opinion. They just know how to win when it counts. They expect to win, they practice winning, and they come up big in the important moments. There is something to be said for that. It isn’t always the best team that comes through in the end, but the team who believes they deserve to be the best. Global coverage has improved in leaps and bounds. Players from both England and Holland (places with very strong traditions on the men’s side of the game) commented on much they felt coverage of the tournament had improved back home. Everywhere, the women’s game is gaining respect and being analyzed tactically and technically in similar ways to the men’s. The ability to follow the games from outside of Sweden was also impressive. In the U.S., all games were shown on ESPN3. I could be wrong, but I don’t remember being able to watch them in 2009. I found myself very jealous that the U.S. does not have an equivalent tournament to the Euros. I think that a major competition in addition to the Women’s World Cup and Olympics is incredibly valuable for the countries and individuals who participate. New heroes emerge, individual players get exposure at the international level and to top club scouts from around the world, and it is another chance to compete for a prestigious title. Maybe we can apply for honorary European status?? UPPER MONTCLAIR, N.J. -- I tried an experiment during my summer break. It was called “Operation: Be a Normal Person.”Ultimate fail. I had a few weeks off before I head back to Sweden to resume training and prepare for the second half of the season at Gothenburg. I decided that it was best for me to take a complete break, both mentally and physically, for at least a week. That’s where my plan kicked in. Finally, I could relax by the pool and not worry about the sun draining my energy. But I got bored just standing in the water I so started doing the pool recovery exercises I’ve learned over the years to loosen up my muscles. Plus, I kept checking the time to make sure I wouldn’t miss the Confederations Cup games. I went out to eat with friends. The normalness plan was going really well. I had no hint of soccer gear on and we talked about regular people stuff. Until I remembered I hadn’t done my ankle exercises in a few days! Good thing no one would notice if I did them inconspicuously under the table. I tried laying out in my yard. But why just lay there aimlessly on the towel when I could do some planks to strengthen my core? And even watching a movie was tough going. It wasn’t my fault I couldn’t focus when the foam roller in my living room kept catching my eye. My IT bands were tight! One of the learning curves of playing professionally has been figuring out my body’s most effective training rhythm. There are so many factors that go into being able to perform at my best at the right time. I used to have to train every day. Even if I couldn’t really train I would make myself touch the ball a bit just so in my mind I hadn’t broken the chain of consecutive days of training. I probably went a few years without missing a day. Eventually I realized that taking a day off — or even a more substantial amount of time (I know, blasphemy!) — can be even more beneficial than training nonstop. Although it’s always a struggle to temporarily free my mind of the discipline I have instilled over the years, I did get some good rest over my break and had a lot of fun while doing it. But I guess being normal is just not for me. I’ll always think Cristiano or Beckham when I see a No. 7. I’ll always make plans and goals when I’m supposed to be relaxing and going with the flow. I’ll always arrange my day around a big game on TV. And I’ll most likely always identify myself as a soccer player above all else.